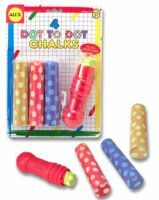 Great for the little artist 4 jumbo Dot to Dot chalks with a colorful plastic chalk holder. The chunky size is perfect for small hands! This is great fun for toddlers and big kids. The whole family can get involved drawing on the driveway, footpath, they can even be used on a blackboard.